Is it possible to get the feeling of 3D depth from a 2D animation work? Are there any relation between the speed of moving layers and the visual message the audience received? Is the colour of the layer reflecting the distance? The layers and background is very important in any animation work as it adds depth to the scene. The movement of layers also add extra value to any animation. I shall discuss the layer movement and how it reflects the depth of the scene. I shall discuss also the relation between the speed and the movement of each layer in the scene and how it related to each other, and the visual message that you get from the layer movement. I will refer to Walt Disney Snow White and the seven Dwarfs and Kong Fu Panda 2 to describe the effect of layer movement in traditional 2D cell animation and the effect of layer movement in CGI 3D animation nowadays. I shall discuss the concept art I used in making layers and backgrounds from using different range of the same colour such as black, dark brown, medium brown ,and light brown to reflect the distance of each layer and how the colours describe the depth. I will discuss also the usage of collage instead of colours and how it could reflects the culture of the city I present in the animation work. I shall discuss the effect of using different materials images like fabrics images in the layers and how this affect the audience perception of the animation work. I will refer to fabrics usage in character design such as Comfort advertising from Aardman studios, and using fabrics in background design in Driver Dan’s Story Train animation from Cbeebies Channel, BBC. The layer movements – Nowadays most of animation software has camera tool that creates the illusion of movement in animation works. In my practice I created the illusion of movement by moving multi layers in different speed without using camera tool just like the traditional techniques of animation. The illusion of movement in traditional animation created by moving the character from one point to another point on the screen, or by moving the background layers opposite character’s movement direction. For example the character walk cycle could start on the right hand side on the screen toward the lift hand side of the screen, or the walk cycle could be fixed on the same point on the screen, the character facing the lift hand side of the screen and by moving the arms and the legs forward and backward plus moving the background from the lift hand side to the right hand side on the screen this create the illusion of character movement. In my animation New York scene The boat have a fixed point on screen and the background moving from lift hand side to right hand side which creates the illusion of boat movement. The layer speed– The character moving forward while the background moving backward this is the illusion we got when we watch animation. The background could be one layer moving the opposite direction of character direction, or multi layers moving opposite of the character direction. The multi layers movement have different speeds which create the scene depth. In real life if you are setting next to the window in a moving train and you are looking at the landscape, you will notice that the sun, the moon and the sky have a fixed point and they does not move, but the layers of trees moving backward in different speeds the closest is the fastest and the visa versa. There are two conditions of the background with a fixed point, the first one when the object is far away like the sun or the moon even the clouds give you the illusion of sky movement. The second condition is when the object in the centre of a circle and you moving around this circle. The layer Depth– Size, speed, and colour are affecting the scene depth. If you are watching an animation scene and you find that the far layer is moving very slowly in the time the close layer is moving very fast you will get a visual message that the distance between the first layer and the last one is very far. The colour also could reflect the distance. If we using the same colour for multi layers the colour is darker when it close and lighter when it is far and this happen in the real life as a result of the gases in air which make the objects with the same colour seems to be darker when it is close and lighter when it is far away. 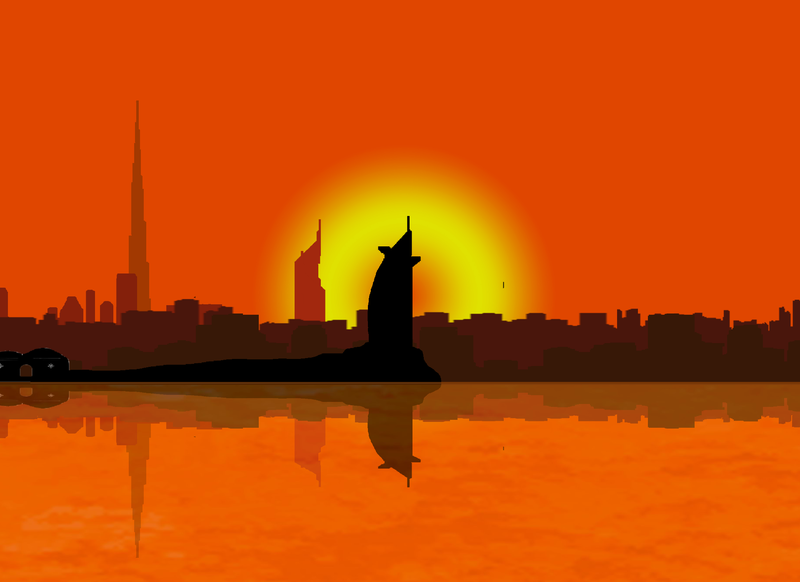 My animation shows this technique in Dubai skyline scene as I used black colour for close layers then dark brown, medium brown, light brown and orange to reflect the distance. The depth in this scene shows by moving the close layer faster and the far the layer slower. The last layer which is Dubai Tower is not moving to show that it is far away and it is in the centre of a circle and we moving around this circle. The layers movement, depth and speed in Disney Snow White and The Seven Dwarfs showes in the scene when Snow White is running in the forest . There were many layers of trees each layer has different speed the closest is the fastest and biggest to reflect the depth. This creates the feeling of 3D environment. Even in 3D CGI films they use 2D layers with the same concept of movement and speed for the background layers so, there are 3D characters in 3D environment mixed with 2D layers for the multi background layers and this techniques showed in Kung Fu Panda background layers. The concept art of background– Using fabrics or collage images instead of colours for the background could add an extra dimension to the animation work as I was experimenting the usage of collage I created from some actors, politician figures, cartoon characters and currency images to reflect the culture of USA. Using NY skyline and statue of liberty as a symbol of the country and reflects the culture which represent by the flashing images on NY skyline. 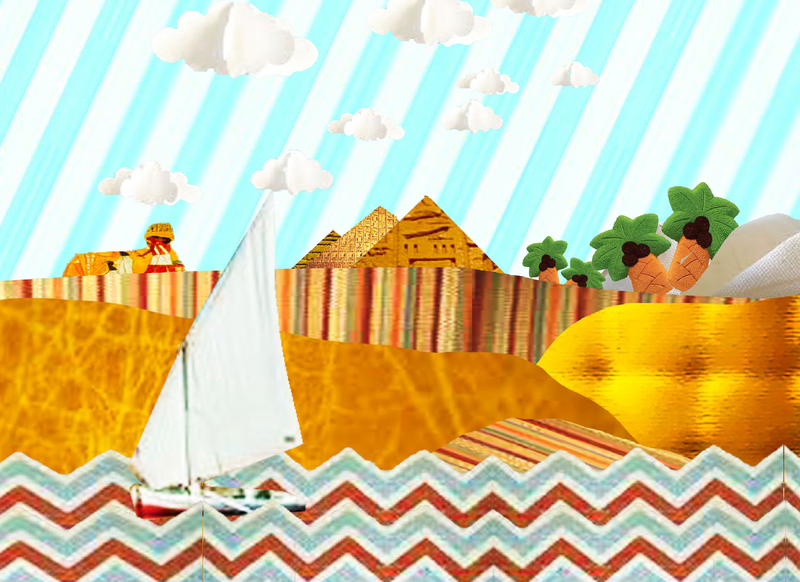 The fabrics images I used in Egypt and NY scenes reflect the usage of fabrics as an alternative, which may appeal to children in cartoons and also could carry a visual message if you are making an advertising. We can see this techniques in Comfort advertising by Aardman studio, as they create the character from fabrics to merge the concept of soft fabric as soft skin .The concept of this advertising is how Comfort cloth softener is soft (soft like soft skin). Driver Dan’s Story Train used the fabrics images in back grounds like clouds sky, buildings to be closer to children artworks which could make the animation more appealing for children. Finally, I discovered that we can create the 3D depth from using 2D layers by building multi layers and control the movement and the speed of each layer. In 3D CGI films they still use the same technique. The 3D technique is used for character modelling and the close environment modelling,but the far layers and background are created in the same traditional 2D animation. The layer colour could reflects the distance the darker colour is the close layer and the lighter colour is the far one. The mixture of speed, size, and movement of each layer create the illusion of depth and make a relation between moving images and still images such as the relation of a building which has a fixed point on the screen and a moving images moving around the building in a circle track. Alternative material images like collage and fabrics could add an extra visual message to the animation work which could be very useful in advertising if you target a specific audience or you need to create propaganda. These techniques push me to experiments 2D characters in 3D environment and experiments 3D characters in 2D environment. Bacher, Hans, Dream Worlds, focal press (2008). Driver Dans Story Train, director: Rebecca Elgar, Cbeebies channel, BBC. Comfort advertising, Aardman commercials, by Aardman. Snow White and the Seven Dwarfs, directed by: David Hand, Disney studio, 1937. Kung Fu Panda 2, directed by: Jennifer Yuh Nelson, Dream Works Studio, 2011. This entry was posted in Uncategorized and tagged digital research paper. Bookmark the permalink.